Combine 2 of Cancun's most popular trip choices and you will enjoy snorkeling, ziplining, ATVs and cenote swimming all in one day! Discover the world's second largest barrier reef right outfront the little fishing village of Puerto Morelos and explore the Mayan jungle ziplining through its trees, four-wheeling deep into jungles terrain and swimming in a cool, fresh-water Mayan cenote. Get your adrenaline pumping as you zipline through the trees and then drive your own buggy off-road to a remote cenote! This combo tour takes you to North America's largest zipline circuit ' covering 12 ziplines over the Cancun jungle ' before an awesome 30-minute buggy ride. You'll have time to swim and relax in the emerald pool before enjoying a light lunch under the shade. The adventure is waiting for you to go into the jungle. Enjoy a thrilling ride aboard an all-terrain vehicle and' enjoy. Set out on an eco-adventure through the Cancun jungle via zipline and ATV on this exciting combo tour, including a visit to a refreshing cenote! Soar through the treetops on 12 ziplines ' considered the best in Mexico ' and head off-road on your own four-wheeler ATV for a 30-minute ride. You'll enjoy swimming and diving into the cenote's emerald green waters before a light lunch under a palapa. Special Offer - Book with us and save 12% compared to another travel site! - Book Now! If bending corners at speed in the safest most capable ultimate Terrain vehicles in the world sounds like fun to you, then this tour is perfect for you. You'll love riding on a 4x4 Circuit Off Road track. Start your engines...Are you ready for the ride of your life? You'll have an unforgettable adventure driving your own all terrain vehicle along well-maintained trails through grassland, jungle and mangrove before reaching an idyllic Caribbean beach where you can enjoy a refreshing swim in the crystal-clear waters! Visit Extreme Adventure Eco Park and have the time of your life during'a'jungle adventure. You'll enjoy three'activities: ziplines, ATV's'and cenote, all combined in one'awesome tour. 'Discover the jungle as you ride on a powerful 4x4 ATV, then zip through the trees on 9 ziplines and walk through hanging bridges. Finally, jump into the refreshing water of a 100% natural Mayan cenote (zipline and'jumping platform). 'Located deep into the Mayan jungle at the " Ruta de los Cenotes", Extreme Adventure Eco Park will offer you the best experience in a small-group setting of 10 people per group. Your tour also includes professional bilingual guides, transport and high safety standards. Start your engines and get ready for the ride of your life. On this Cancun ATV tour, you'll have an unforgettable adventure driving your own all-terrain vehicle along well-maintained trails through grassland, jungle and mangroves. Then, reach an idyllic Caribbean beach where you can enjoy a refreshing swim in the crystal-clear waters! Jump-start your adrenaline with this half-day eco-adventure through Selvatica, an award-winning Cancun jungle park. 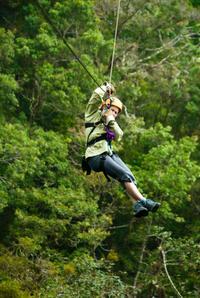 Soar through the rainforest canopy on 12 ziplines and motor off-road on a personal ATV (all-terrain vehicle). Wash off the jungle grime with a relaxing dip in a Mayan cenote, and then enjoy a light meal under the shade of a palapa. Receive personalized attention on this small-group tour capped at 10 people, and never wait in line for the next activity. 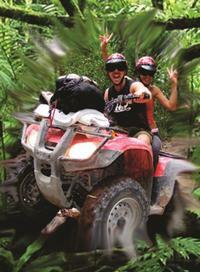 Roar along jungle trails aboard an ATV inside Native’s Park, one of Playa del Carmen’s newer attractions. Inside this adventure park that doubles as a nature reserve, discover ancient Maya ruins, swim in a cenote and enter a cave with beautiful rock formations. At a small ranch, meet one of Playa del Carmen’s first settlers and participate in a Maya ceremony. Wrap up this day trip with free time to explore La Quinta Avenida and nearby beaches on your own. Enjoy personalized attention on this small-group tour limited to 10 people.